Cluster headaches are different from other headaches not only because of the often excruciating pain but because the attacks occur in cyclical patterns or 'clusters.' Cluster periods may last from a few weeks to several months, with remission periods where no headaches are experienced. The pattern occurring may vary greatly but on average, most people will suffer from one or two cluster periods in a year. What do Cluster Headaches Feel Like? Cluster headaches typically come on quickly and without warning; they peak within 2 to 15 minutes and can last from 45 to 90 minutes. The pain begins around one eye and can be excruciating. The pain tends to remain on one side of the head during an attack but can switch to the other side over the course of another attack. It is a sharp, burning pain that is often described as a 'hot poker' sensation in the eye and head. The pain is so intense that sufferers may find they are restless, cannot sit still and are pacing during an attack. Symptoms usually last only for the duration of the headache. However, the intensity of pain experienced from cluster headaches can be quite frightening for both the sufferer and those around him or her. The headaches may also leave a person exhausted afterwards. 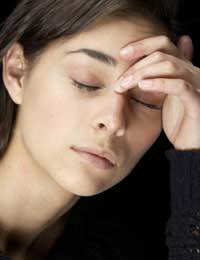 A direct cause of cluster headaches has not been determined, but various factors may predispose someone to an attack. Cluster Headaches are categorized based on the length of the cluster period and the remission time. Cluster headaches are rare. Unlike migraines, men are more commonly affected by cluster headaches than women. In fact, 85 percent of people who get cluster headaches are men. Women are more likely to experience a first attack after age 50 although on average, the onset for both sexes combined is between 20 and 50 years. There are various treatments available for cluster headaches. There is no cure for cluster headaches and the treatment goal is to relieve the pain. Avoiding triggers such as smoking and alcohol may reduce the frequency of cluster episodes. One medication is taken during a period where a person is experiencing cluster headaches and another is taken immediately when a cluster headache occurs. Ergot preparations are those containing ergotamine tartrate and these may be helpful although often have severe side effects. Methysergide maleate may be helpful in preventing attacks and relieving pain. Since an orally ingested medication can require more time to take effect, your doctor may prescribe a medication taken by inhaler, as an injection or possibly as a rectal suppository. Oxygen inhalation may also provide pain relief for some sufferers. Cluster headaches are not life threatening but can be highly debilitating. Try talking to your doctor, making lifestyle changes and working out a personalized medication plan, You will hopefully be able to reduce cluster headaches cycles and attacks, allowing for a more manageable day.